I just got the call. I am going to be an English teacher this coming school year! It has been a long dream of mine to become an English teacher. I love writing and reading, and love helping children learn how to master the art of writing well. Speaking as a mom, it is important for us to have our children involved in as much summer reading as possible. I could go on for hours about why this is important, but I have two top reasons that I am comfortable sticking with. This is not made up by teachers, it is a real thing that I witness first hand. Each summer kids lose a percentage of what they learned during the previous school year. When the new school year hits, teachers will begin teaching with current standards. Very little time is spent getting kids caught back up to speed with previous standards. Summer reading helps kids stay up to date with standards. Overall, summer reading is important for combating summer slide. Elementary school teachers try so hard all school year long to get children up to grade level standards. Ultimately, this is defeated as soon as summer hits. It is known that students revert a grade level over summer, leaving teachers scrambling the next school year to get kids back to their previous standard, then build up to the current. Unfortunately, it is a never-ending cycle that will determine a child’s success in high school and college. At home, we battle summer slide and summer learning loss by continuing to read at grade level and higher over summer. 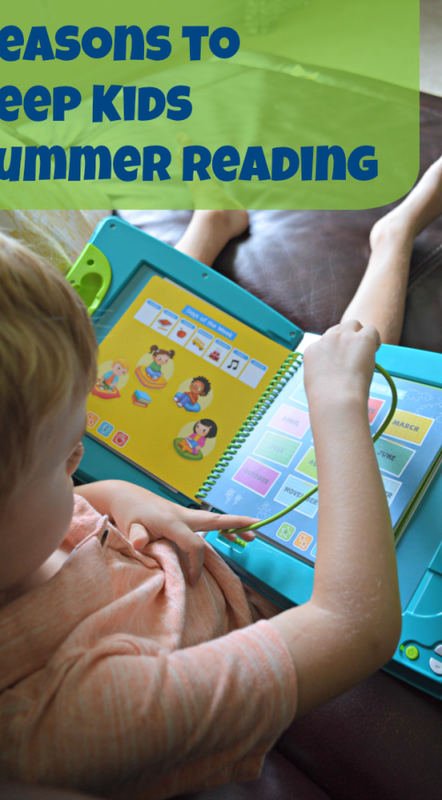 We have been using LeapFrog LeapStart all-in-one interactive early learning system. It is great for preschool through 1st grade, packed with school and life skills for 2-7 year olds. Aidan has been excited about trying out this brand new learning system, especially the great STEM features! The book is enclosed in a kid-friendly tough case and comes with a stylus designed to fit in his small hands. The LeapStart retails at $39.99 and includes a sampler book, and the re-playable books are sold separately for $12.99 each. This is a great investment for a child going into Preschool or Kindergarten, especially! To keep updated with LeapFrog follow their social media channels on Facebook, Twitter, YouTube, and Pinterest!